Been busy with some other Shingworks stuff… for Patrons, a new tutorial about creating your own Patreon campaign is now up! And, because my philosophy about these things is to make sure I make my stuff free online to everyone eventually, the tutorial about Coloring with Masks is up for general viewing now (and forever). I’ll be making these tutorials available (at a slightly lower resolution than the Patreon version) to everyone 6 months after their original post date. Next page tomorrow with the list of Thrip sticker winners from October! And will be posting the Patreon winners over there in a few hours. …What? It’s saying something else? First Uruk-hai. Now Ents. Poor Mike doesn’t realize he’s stumbled into the Martian version of Lord of the Rings. 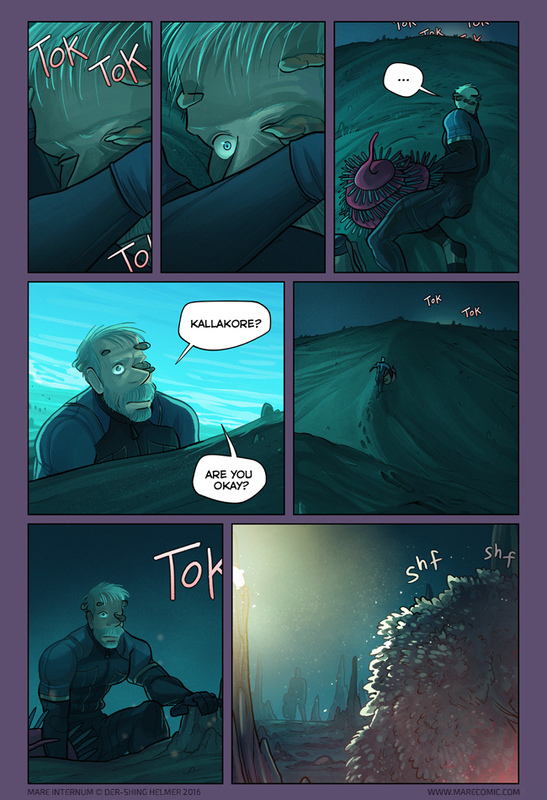 I think Kallakore WAS Martian Gollum. … did Bex grow Martian Cauliflower Hair? Please don’t leave us shivering with antici………… pation! Read from page one over the last few weeks and am loving the comic. I do wonder though if you could get a mobile site going? I’m reading on an iPhone 6+ (the big screen) and still have to zoom in because there’s a lot bordering the actual art. Keep the story going, we love it! Dear god, please don’t ruin this beautiful mobile-friendly site by forcing “mobile” browsing on us. Lol, I have zero interest in redesigning the entire site. But I don’t think or ask about optimizing for mobile, and sometimes my implementation guy knows about low-hanging-fruit type fixes in the code. If Bex killed Kalla I’m going to be SO unimpressed with her personal conduct. Yeeeeah… that was my thought too. I will be so sad if the next page shows us Bex eating Kalla. Did Bex get herself a bush-friend? That’s a questionable addition to the list of friends we have already. Former president George W. Bush!?!?! What are you doing on Mars?! Kalla certainly didn’t expect to get am-bushed! Hang on. Considering the scenery has been rocks, rocks and more rocks for the last few pages, how did Kalla find a bush to hide in? Hmm, my comment seems to have dissapeared, or I just can’t see it? Thank you very much for making the tutorials slowly available for even the non-patreon people! Haha, sorry I manually accept new commenters to reduce spambot posts! You’re good to go (and, you’re welcome! I am also patient and stingy so I gotta look out). Not from the comics, but from comments we know that Braid is on another station. Some people got confused in the chapter 1, it was LEVi who was missing and nothing happened to Braid, the project just got cancelled, she was moved elsewhere immediately and Mikey got F-ed. Is this the first time he’s ever said Kalla’s name out loud? I was under the impression he’d be the type to totally forget a name if it’s been said only once, haha. Is no one gonna talk about panel 3? – Damn boi, Mike is fit af. FFS Mike, PULL THAT THING OFF YOUR EYELID ALREADY.